Antifreeze added to food and drink? - Flavor Scientist Chemicals or ingredients that are safe to use in food are found in non-food applications. You are here: Home / Food Safety / Antifreeze added to food and drink? Antifreeze added to food and drink? Amyl acetate is a fairly inexpensive flavor chemical that smells like banana. I took a small bottle of this aromatic chemical from my flavor lab to use at home. Why? Because Amyl acetate is also a spot and stain remover. Some dry cleaners refer to this spot remover for paint or ink as “banana oil”. When I found out a chemical I used to make food flavors was used as a dry cleaning chemical, I was alarmed. Then, once I realized I could inexpensively and quickly salvage my children’s paint stained school clothes with a small bottle of “banana oil”, I relaxed. Chemicals or ingredients that are safe to use in food are found in non-food applications. 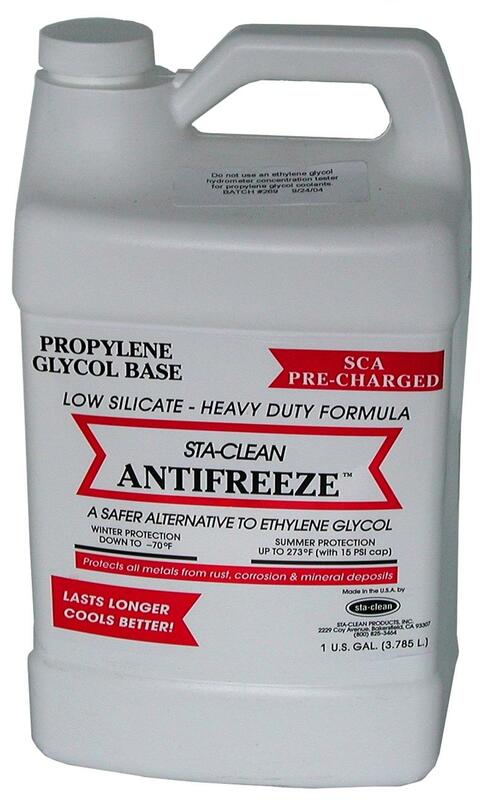 Recently, I discovered a flavor carrier, propylene glycol, is also useful as an antifreeze for cars. If I was still driving my 1987 Dodge Colt with flame stickers on the doors, I might take some propylene glycol from the flavor lab and see how it works in my car. My husband would lose his mind if I tried to use propylene glycol in my car or heaven forbid in his Audi. After 18+ years together, my husband is beginning to respect that I know a few things about chemicals, but he isn’t quite ready to trust me with his car. Besides the threat of upsetting my husband, I wouldn’t take propylene glycol from the flavor lab to use in my car. Cars are a lot more expensive than clothes and I only know how to use propylene glycol in flavors. The flavor industry uses propylene glycol as a carrier for flavors. It is important to have a carrier for flavorings because they preserve flavors and make flavors useable. Measuring 0.005 pounds of cinnamon flavor is difficult to do accurately, and 0.10 pounds is a lot easier to measure in a food production setting. Often propylene glycol is 40-90% of a flavor formula and can cost $0.30-2.50 per pound. Propylene glycol is stable, but can react with flavor ingredients like benzaldehyde to give off odors and tastes. It can also attract water (humectant) and is not a good carrier for a hard candy or chewing gum flavors. You would end up with a sticky mess if propylene glycol was used as a flavor carrier for a confection product. Propylene glycol is very useful as a beverage flavor carrier because it is used at a low level (usually 004-0.39%) and it helps a flavor stay dispersed. The food and flavor industry is careful to buy food grade USP propylene glycol. The extremely bitter taste of propylene glycol limits its use in food and beverage products. In the United States, there are also regulatory restrictions on use of propylene glycol in food; more information is available from the Code of Federal Regulations and the Alcoholic Trade and Tax Bureau’s website. In addition to these regulations, the Environmental Protection Agency (EPA) assess the human risk of exposure to propylene glycol. Other flavor carriers I routinely use are vegetable oil, corn syrup, invert sugar, glycerine, water, ethyl alcohol (Everclear 190 Proof), dextrose and MCT (Medium Chain Triglycerides). Depending on the flavor, application, regulatory limits and cost, I carefully choose a carrier for a flavors. In fact, I enjoy the puzzle of choosing a flavor carrier. Often, one does not see propylene glycol on a label. Propylene glycol is considered a processing aid to deliver flavor, has no function in the food and there is no requirement to put it on the food label. If you want food without propylene glycol, choose organic foods. USDA Organic regulations prohibit the use of synthetic carriers. Propylene glycol is synthetic and often described as a derivative from petroleum processing. Do I worry about “anti-freeze” in food? Not too much. If the food product tastes good, I usually overlook small risks. I occasionally drink alcohol (a known carcinogen) and eat raw fish (a risky food). Personally, I find that the taste benefit outweighs the risk. My children are not allowed to consume alcohol or eat raw fish, but may end up consuming these risky foods as adults. Do I like my children to consume flavored foods that may contain propylene glycol? I prefer that my children drink juice, milk or water and not flavored drinks, but they love colored and flavored products. Therefore, as a family, we strive for balance and I allow these beverages as treats. What do I think about the recent recall in Europe for Fireball Cinnamon Whisky which tested high for propylene glycol? I am thrilled to hear that government agencies are enforcing regulations and testing products for compliance. I also think that if you are consuming a highly flavored alcoholic beverage, propylene glycol is the least of your worries. As a result of this recall, I anticipate flavor and food & beverage companies will be working closely together to assure that this mistake does not happen again. Nice article, Susie. I find it annoying when people, or the media, mention the fact that some harmless substance can be used as antifreeze, or cleaner, or some other non-food purpose as evidence that it can’t be safe to eat. Hey, they should be glad that a nontoxic substance has so many applications! For instance, benzyl benzoate is a fairly common flavor ingredient, but what if the media learn that it’s also used as a lice killer in veterinary hospitals? The horror! I wonder about the bitter taste. I have a bottle of PG (propylene glycol) at home and it has a very mild bittersweet taste. On the other hand, once I tasted PEG-400 (which is not really toxic but not for food use either) and I found it extremely bitter. So could it be that some manufacturers add a bittering agent to PG, and same thing PEG-400, or maybe there are other factors at play? I’d say my PG has become a bit less sweet and more bitter with storage time, but maybe it’s just my impression. Hi Martin: Scientists are naturally curious, so we probably find it more interesting than alarming that a substance has different properties and uses. I describe propylene glycol as bitter, however, my colleagues have told me that I’m sensitive to bitter. I worked with PEG-400 when I was formulating flavors for mouth rinses.In the US, mouth rinse is regulated as a cosmetic and not a food, since it is not consumed. Usually I taste everything I work with, but do not remember tasting PEG-400. My memory is that PEG is a great solubilizer if used correctly. I doubt pure propylene glycol is bitter. It is added to prepared grated coconut to keep it from drying up – the quantity of PG in it must be quite high, and yet it tastes good. If you don’t believe buy grated coconut in grocery store and taste it.